November 1939. "Hughesville, Missouri, where the headquarters of the Osage Farms project is located, was once one of the largest livestock and grain shipping points in the state." Acetate negative by Arthur Rothstein. View full size. Submitted by johnnysilvertone on Thu, 10/25/2018 - 3:04pm. I love that crown on top of the pump! Submitted by swingman on Wed, 10/24/2018 - 8:01pm. At the current population of 184, it rivals my late Uncle's last home of Upland, Nebraska (pop. 175). From the looks of the place (seen on Google Earth, of which I'm not about to incur the wrath of not knowing how to embed the image, despite no directions previously shown), the "Hotel" looks to have had 3-4 rooms, tops. About 30-35 feet wide, about 60-70 feet deep on 2 stories. 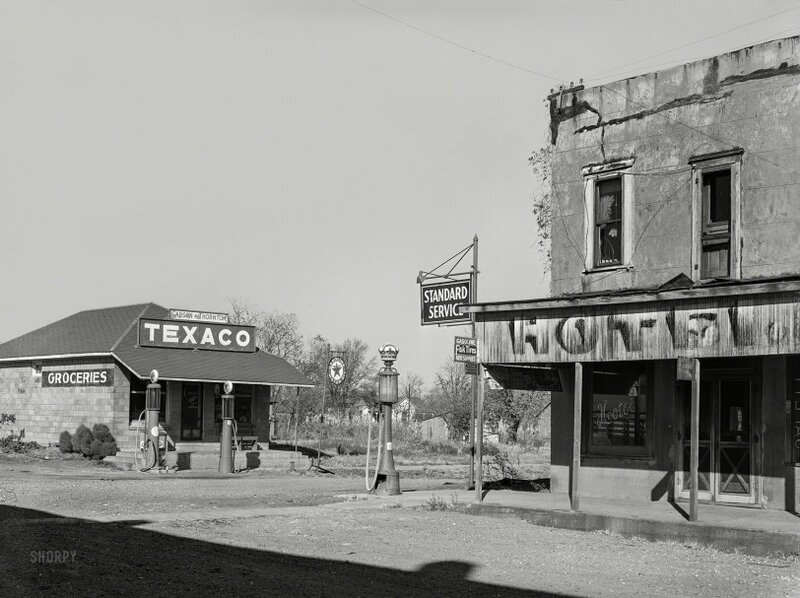 The "Town Hall" is a couple doors out of frame to the right of JD's picture above - a tiny, one-story former bank. The town's post office is what's seen at the center of the same picture, while a red-roofed former "Farm and Auto" repair shop stands behind the two-bay beside the post office. 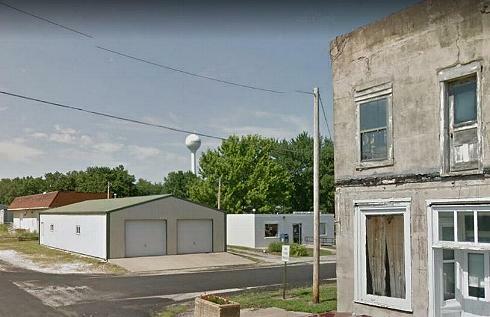 In "exploring" the town via Google Earth, I believe what you're seeing in both pictures is the liveliest part of town - indeed, that's Hughesville's Main Street in front of the hotel. Submitted by Alex on Wed, 10/24/2018 - 7:07am. George W. Thornton, a successful farmer, Hughesville township, is a native son of Pettis County, and is a son and 16th (!) and last child of Hiram Thornton, one of the best known of the early settlers of Pettis County, and Sophia (Turley) Thornton. George W. Thornton was left an orphan at the age of 13 years in 1876 and began doing for himself at that age. On December 28 1892, Mr. Thornton was married to Miss Bettie Carson, a daughter (5th of 10 children) of James and Narcissus (Garner) Carson, natives of Ireland, who settled in Franklin County Missouri, coming to the State from Illinois in 1879. Emery was the brother of Sarah J. (Garner) ... and Narcissa/Narcissus G. Garner who later married James Carson and died in Pettis County,MO. Submitted by JD on Tue, 10/23/2018 - 6:25pm. The gas station, not so much.